^ Iran. CIA world factbook. [2010-01-27]. （原始内容存档于2012-02-03） （英语）. ^ Ethnic Groups and Languages of Iran (PDF). Library of Congress, Library of Congress – Federal Research Division. [2010-01-27] （英语）. ^ Afghanistan. The World Factbook. Central Intelligence Agency. 2007-12-13 [2010-01-27]. ^ Dupree, L. Afghānistān: (iv.) ethnocgraphy. (编) Ehsan Yarshater. Encyclopædia Iranica. United States: Columbia University. [2010-01-27]. （原始内容存档于2006-10-19）. ^ Tajikistan. The World Factbook. Central Intelligence Agency. 2007-12-13 [2010-01-27]. ^ Uzbekistan. The World Factbook. Central Intelligence Agency. 2007-12-13 [2010-01-27]. ^ 4. НАЦИОНАЛЬНЫЙ СОСТАВ, ГРАЖДАНСТВО НАСЕЛЕНИЯ（2002年俄羅斯人口普查）. [2010-01-27]. （原始内容存档于2012-03-09） （俄语）. ^ 11.00 11.01 11.02 11.03 11.04 11.05 11.06 11.07 11.08 11.09 11.10 11.11 The Persian Diaspora. farsinet.com. [2010-01-27] （英语）. ^ Persian-speaking people outside of Iran. persianwo.org. [2010-01-27]. （原始内容存档于2009-10-30） （英语）. ^ Migration and development. gtz.de. [2010-01-27]. （原始内容存档于2007-09-27） （英语）. ^ 14.0 14.1 Farsi, Western. ethnologue.com. [2010-01-27] （英语）. ^ Phyllis McIntosh. Iranian-Americans reported among most highly educated in U.S.. iranian.com. 2004-01-26 [2010-01-27] （英语）. ^ The Persian Diaspora, List of Persians and Persian Speaking Peoples living outside of Iran, Worldwide Outreach to Persians, Outreach to Muslims around the Globe. [2010-01-27] （英语）. ^ 這數字只包括來自阿富汗的塔吉克人，從阿富汗到美國的人口約為80414人（2005年），當中65%是塔吉克人。 US demographic census. [2010-01-27]. 引文使用过时参数coauthors (帮助); 使用|coauthors=需要含有|author= (帮助) Robson, Barbara and Lipson, Juliene (2002) "Chapter 5(B)- The People: The Tajiks and Other Dari-Speaking Groups" 互联网档案馆的存檔，存档日期2010-01-27. The Afghans - their history and culture Cultural Orientation Resource Center, Center for Applied Linguistics, Washington, D.C., OCLC 56081073. ^ Ethnic composition of the population in Kyrgyzstan 1999-2007 (PDF). [2010-01-27]. （原始内容 (PDF)存档于2012-02-19） （英语）. ^ 2006 Canadian Census. Statistic Canada. [2010-01-27] （英语）. ^ 這數字只包括來自阿富汗的塔吉克人，據2006年加拿大的人口普查數字，留居加拿大的阿富汗人約有48090人，當中塔吉克人佔33%。Ethnic origins, 2006 counts, for Canada. ^ Travel Video Television News - Iranians investing heavily in Dubai. travelvideo.tv. [2010-01-28]. （原始内容存档于2007-10-13） （英语）. ^ Tension and Transformation (PDF). agape.org.uk. [2010-01-28]. （原始内容 (PDF)存档于2008-10-02） （英语）. ^ Jews, by country of origin and age. cbs.gov.il. [2010-01-28] （英语）. ^ 14 report for Bahrain. ethnologue.com. [2010-01-28]. （Ethnologue 原始内容 请检查|url=值 (帮助)存档于2009年5月6日） （英语）. ^ 2054.0 Australian Census Analytic Program: Australians' Ancestries (2001 (Corrigendum) (PDF). Australian Bureau of Statistics. [2010-01-28] （英语）. ^ Immigrazione (PDF). [2010-01-28]. （原始内容 (PDF)存档于2009-09-28） （意大利语）. ^ History of Iran. Iranologie. [2010-01-28]. （原始内容存档于2012-03-01） （英语）. ^ Lands of Iran. Encyclopedia Iranica. 2005-07-25 [2010-01-28] （英语）. ^ Scholastic Library Publishing. Encyclopedia Americana. 第30冊. Scholastic Library Publishing. 2006年: 第249頁. ISBN 0717201392 （英语）. ^ James Gannon. Military occupations in the age of self-determination: the history neocons neglected. ABC-CLIO. 2008年: 第131頁. ISBN 0313353824 （英语）. ^ Sandra Mackey、W. Scott Harrop. 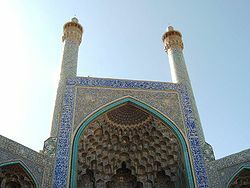 The Iranians: Persia, Islam and the soul of a nation. Dutton. 1996年: 第2頁. ISBN 0525940057 （英语）. ^ Sāzmān-i Tablīghāt-i Islāmī. Islamic Republic of Iran today. Islamic Propagation Organization. 1987年: 第13頁 （英语）. ^ Liddell and Scott. Lexicon of the Greek Language. Oxford. 1882年: 第1205頁 （英语）. ^ Johann Peter Lange、Philip Schaff. A commentary on the Holy Scriptures: critical, doctrinal, and homilectical, with special reference to ministers and students. 第7冊. C. Scribner & co. 1877年: 第30頁 （英语）. ^ Jona Lendering. Parthia. Livius. [2010-01-30] （英语）. ^ IRAN, v(2). Pre-Islamic Period. Center for Iranian Studies, Encyclopædia Iranica. [2010-01-30] （英语）. ^ CYRTIANS. Center for Iranian Studies, Encyclopædia Iranica. [2010-01-30] （英语）. ^ Abu Rahyan Biruni. Athar al-Baqqiya 'an al-Qurun al-Xaliyyah. 2001年: 第56頁 （阿拉伯语）. ^ Clifford Edmund Bosworth. The Encyclopaedia of Islam. Brill. 2001年: 第632頁. ISBN 9004081127 （英语）. ^ Al Mas'udi. Kitab al-Tanbih wa-l-Ishraf. Brill. 1894年: 第77–78頁 （阿拉伯语）. ^ Cyrus Ghani. Iran and the rise of Reza Shah: from Qajar collapse to Pahlavi rule. I.B.Tauris. 2001年: 第310頁. ISBN 1860646298 （英语）. ^ Persian. Merraim-Webster's Online Dictionary. [2010-02-02] （英语）. ^ Anna Bentkowska-Kafel、Trish Cashen、Hazel Gardiner. Digital art history: a subject in transition. Intellect Books. 2005年: 第49頁. ISBN 1841501166 （英语）. ^ Languages of Pakistan. Ethnologue. [2010-02-02] （英语）. ^ David Levinson. Encyclopedia of World Cultures: Russia and Eurasia, China. G.K. Hall. 1994年: 第357頁. ISBN 0816118108 （英语）. ^ Joe Bindloss、Sarina Singh. India. Lonely Planet. 2007年: 第63頁. ISBN 1741043085 （英语）. ^ Mary Boyce. Textual sources for the study of Zoroastrianism. Manchester University Press ND. 1984年: 第153頁. ISBN 0719010640 （英语）. ^ R. Khanam. Encyclopaedic ethnography of Middle-East and Central Asia: J-O. Global Vision Publishing Ho. 2005年: 第128頁. ISBN 8182200628 （英语）. ^ Pam O'Toole. Afghan poll's ethnic battleground. BBC News. 2004-10-06 [2010-02-09] （英语）. ^ Seyyed Vali Reza Nasr. The Shia revival: how conflicts within Islam will shape the future. Norton. 2006年: 第76頁. ISBN 0393062112 （英语）. ^ Ehsan Yar-Shater. Encyclopaedia Iranica. 第2冊. Routledge & Kegan Paul. 1982年: 第239頁 （英语）. ^ National Spiritual Assembly of the Bahá'ís of the United States. World order. 第19-20冊. National Spiritual Assembly of the Bahá'ís of the United States. 1984年: 第12頁 （英语）. ^ Ira Marvin Lapidus. A history of Islamic societies. Cambridge University Press. 2002年: 第131頁. ISBN 0521779332 （英语）. ^ Iftikhar Ahmad. World cultures: a global mosaic. Prentice Hall. 1993年: 第194頁. ISBN 0132967812 （英语）. ^ Karen Zeinert. The Persian Empire. Marshall Cavendish. 1997年: 第61頁. ISBN 0761400893 （英语）. ^ Jennifer Bloomer. Sexuality & space. Princeton Architectural Press. 1996年: 第367頁. ISBN 1878271083 （英语）. ^ Plutarch. Themistocles. Bartleby. [2010-02-13] （英语）. ^ Leigh-Ann Bedal. The Petra pool-complex: a Hellenistic paradeisos in the Nabataean capital. Gorgias Press LLC. 2004年: 第123頁. ISBN 1593331207 （英语）. ^ Arjun Appadurai. The Social life of things: commodities in cultural perspective. Cambridge University Press. 1988年: 第212頁. ISBN 0521357268 （英语）. ^ National Spiritual Assembly of the Bahá'ís of the United States. World order. 第32-33冊. National Spiritual Assembly of the Bahá'ís of the United States. 2000年: 第47頁 （英语）. ^ Sarah Henderson、Alana S. Jeydel. Participation and protest: women and politics in a global world. Oxford University Press. 2007年: 第24頁. ISBN 019515925X （英语）.